There’s so much press devoted to the idea of early retirement, but is it even really possible for the average person? The answer to that is almost certainly yes, but it’s all in the numbers. As in, you have to get the numbers right in order to have any hope of it working out. If you want to retire early, the most important effort on your part will be to save as much money as you can. This will go well beyond the usual recommendations of saving 10% or 15% your pay. You have to think in much bigger terms. How much you’ll have to save will depend upon how far out into the future you want to retire. The more years than you have, the lower the percentage of your income that you need to save. Less years will mean that you’ll have to save a higher percentage. For our purposes however, if you want to retire in a reasonable timeframe – let’s say 20 years – you will have to be saving something on the order of 25% of your gross. You lower the amount of money that you need to live on – which means you’ll need less money in retirement. The first point is self-explanatory, but let’s spend a little bit of time on the second – it’s often overlooked. People often try to define their retirement goals based on their current living standards. Unless you’re already wealthy, saving up enough money to be able to retire without lowering your cost of living from where it is now will probably require something close to 50 years. That’s not early retirement, and that’s why we have to discount plans that include savings rates that are considered “more manageable” by conventional standards (like 10% of your income). Early retirement is a privilege that is exclusive to either the already wealthy, or to those willing to make deep and even painful sacrifices in the present to provide for a more leisurely future. 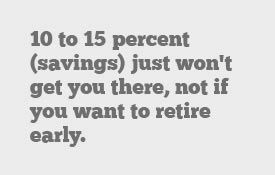 10% to 15% just won’t get you there, not if you want to retire early. You’re probably scratching your head wondering how you can possibly live on only 75% of your gross income. It’s a reasonable concern, but doing so is hardly out of bounds. I can say that because there are people doing it right now, though it’s not always for the purpose of saving for early retirement. Will it be easy? Not unless you’re already doing it. If you aren’t, here are some suggestions for ways that you can make it happen. Cut your housing costs – Most people pay way too much for housing, without realizing that most other expenses are tied to housing. This is your biggest expense, and the richest source of savings. Stay out of debt – The less money that has to go into debt payments, the more you’ll have for savings and investment. Stop buying new cars – This is one of the best ways to stay out of debt, and it keeps insurance and ad valorem taxes low too. Keep entertainment expenses to a minimum – Rent videos, cook your meals at home, learn to enjoy family and friends (more than paid activities) and stay out of bars! Buy secondhand where ever possible – You can buy clothing, appliances, furniture, car parts and nearly everything you can think of on the cheap by buying them secondhand. This is just a small sampling of the ways you can cut your living expenses. There are literally dozens of ways to do this without seriously affecting your lifestyle in a big way. One of the biggest challenges to the would-be early retiree is the very real prospect of running out of money after retiring. After all, since early retirement will mean that you will spend a greater portion of your life retired, the likelihood of outliving your money is far greater. You can work around this by keeping your portfolio withdrawals limited to what is known as the safe withdrawal rate. This is probably a theory than anything else, but it is actually quite logical. The safe withdrawal rate holds that if you limit your portfolio withdrawals to not more than 4% per year, your portfolio will never run out. For example, if you earn an average rate of return of 8% on your portfolio over the very long term, 4% withdrawals will leave 4% in your portfolio to protect it from inflation and to keep growing at least a little. The theory isn’t perfect – if the rate of inflation exceeds 4%, the safe withdrawal rate you won’t be so safe. And if the rate of return on your portfolio is below 8%, or goes negative, for a substantial amount of time – that’s another complication. The key to the theory is that it statistically works over a period of many decades. The flaw is that you could experience a decade where it doesn’t work at all. Let’s try working an example to see how this will play out. Start with a good investment calculator to make number-crunching easy. If you invest $25,000 per year in each of the next 20 years, with an average annual rate of return on your portfolio of 8%, you will have $1,235,573 in your portfolio at the end. If you withdraw 4% per year, that will give you $49,423 for living expenses, or just about the $50,000 per year that you’ll be living on between now and then. Meanwhile the 4% in earnings that you retain in your portfolio will keep it growing to account for inflation, so that you’ll never run out of money. Once again, it’s all in the numbers. Age can be a factor when it comes to planning for early retirement. Let’s say you’re 45 years old, and planning to retire at 65; that can work especially well since that’s about the age when Social Security and Medicare will be available to you. They will either reduce the amount of money that you need to have in your investment portfolio, or they can provide you with extra budgetary breathing room once you retire. On the flipside, let’s say that you are 25 and planning to retire at 45 – it may not be quite as simple. If you are single and childless, it may be very doable. If you have a family – or plan to have one during that time – there will be some obvious complications. First, you’ll almost certainly need to commit a greater percent of your income for the support of your family over the next 20 years. Second, at the end of that 20 years, you may find yourself still owing a mortgage on your home, and needing to provide a college education for your children. The other hand, if your children will be grown – and their education behind is behind you – by the time you reach your targeted early retirement date, it may work out as planned. It just may require a little more creativity along the way. Use the investment calculator in the post, and see what you can come up with for an early retirement date. Plan on saving as much money as you need between now and then to make it happen. Does your early retirement planning look anything like this? Does Retirement Give You All The Peace You Desire? What Would Your Ideal Retirement Look Like? Holy Crap! I’m Going to Run Out of Money! A freelance personal finance writer and "thrifty guy" who runs the site, Out of Your Rut, Kevin contributes insightful articles to TTG several times a year. When Should You File an Insurance Claim? I’m of the opinion that it’s enough to have a nice size bankroll, and be in a position to take breaks from work from time to time. Complete early retirement is neither right nor doable for everyone. But a nice mini-retirement from time to time, or a permanent semi-retirement can do just as well. Your scenario has people retiring with $49,000 a year – which sounds ok BUT… You forgot to mention that inflation will make that $49,000 actually be $25,000 in today’s dollars – which is NOT enough to live on! Hi Chris – That’s an excellent point, but we don’t know what inflation will do going forward. We may even have a bout of deflation (I’ve read some articles and it isn’t inconceivable). Even if not, the effect of inflation will depend heavily on your time horizon, as obviously 10 years will involve lesss inflation than 20. Inflation is yet another issue that complicates retirement planning, whether early or at normal retirement age. It is a complete X factor. Also, you still need to pay tax on the $49K, so your retirement lifestyle will go down compared to the $50K spending previously spent. Mind you expenses should be less if one is not working. That’s true, but they should be minimal. For one thing, you won’t have to pay FICA taxes, since it won’t be earned income. You may find yourself paying only $4-5,000 in taxes on $50,000 k income. That may be offset by the sudden absense of job-related expenses, like communting, lunches and the various efforts to combat stress. I’ve cut my expenses as much as I think is reasonable right now without living on rice & peas or having no form of social life. But I’ve edited, analyzed, cut and re-aligned my spending to (a) save more money each month and (b) ensure I’m spending money on things that really matter to me. In doing so I’ve managed to achieve a savings rate of around 40% – but my plan now is to increase my income over the next 12-18 months so I can double this to an 80% savings rate. If I can achieve this then I’m less than 7 years away from a potential early retirement. I have a (secret) plan for making that happen but it’s going to take some serious work to boost my income so much when there’s very little additional budgeting that’s possible. Wow Richard, that sounds like a plan. Even if you could keep it going for just a few years, you’ll easily have financial independence, if not full-on retitrement. Good luck my friend. I want to retire and be financially independent before I reach the age of 40. I’m not even 20 yet, and my plan is pretty simple it’s to earn more, save more, and invest more each year. Hi Mark – 20 is the perfect age to begin living on the cheap, and saving and investing all that you can. The combination might get you just where you want to go by 40. You’ll have to dedicate yourself to the plan and not get distracted, but this is a great time. Not my goal. I’d rather work on building my own business or profile enough so that I could work from home and have flexibility then. I also would rather have these years to travel while we are still young instead of having to do some drastic savings for a future that isn’t guaranteed. That being said, I totally respect those who do make this happen. I’m blown away by it all. Hi Michelle – I’ve actually heard “I also would rather have these years to travel while we are still young” but mostly from older people who wished they’d done just that. I think balance is always the key – enjoying today while making a provision for the future. And if you think about it, none of us know how much time we have, so now is REALLY important. I know early retirement is huge in the PF world, but I don’t think that’s my goal. I want financial freedom and to be self employed, but I like the idea of running my business for a long time. I’d rather enjoy trips and fun throughout my life than reserving it all for one time in my life. There’s something to your line of reasoning Stephanie. Throwing all of your efforts into improving the back end of your life can leave the present feeling like an empty void. I’d rather save less, and prepare for an early semi-retirement. But the topic of the article is early retirement, so we wanted to show what it would take to make that happen. So few people are actually able to do it because it does require a serious effort over a very long period of time. My take on early retirement is, “why would I want to?” I love my job, the interaction with other people, and the mental challenge it provides me each day. Maybe my viewpoint will change one day, but right now the thought of retiring is thinking of an existence that would bore me to tears. Hi Travis – I’m with you! I think that for most people, some form of semi-retirement would be a better goal. Easier to reach (rather than saving 25% of your income) and you’ll have an income and something to do all your life. Not a bad package! Great and thorough post as usual, Kevin. Love the “finding more money for retirement” portion, here. These are all ideas that go against the American norm of “consume all that you can”, but really, living without things like a new car every three years and a massive house isn’t bad at all. Hi Laurie – I also think that learning to live without all those extras also helps you to prepare for retirement by teaching you that you can successfully live on less. The less you need, the easier it will be to retire.